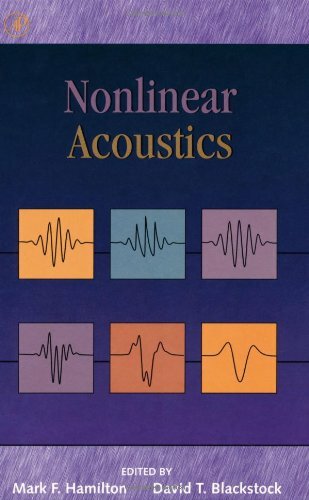 "Nonlinear Acoustics: Theory and Applications" is an introductory text on the theory and applications of nonlinear acoustics. This book develops the theory on nonlinear acoustics from physical principles. The first half of the book develops the physical concepts, mathematical models, and classical methods of solution that form the theoretical framework of nonlinear acoustics. Benchmark experiences are described and many applications are discussed in detail. The second half covers special topics and applications, both theory and experiment. The material is accessible to anyone familiar with the principles normally encountered in a basic course on the physical aspects of linear acoustics. Each chapter is written by experts in their respective fields. It includes basic theory and model equations developed from first principles; explains the extensive history of nonlinear acoustics and the Burger's equation; describes the analytical, perturbation, and numerical methods of solution; and introduces nonlinear waves in solids. The applications included methods for: Determining the nonlinearity parameter; Suppression of sound by sound; Acoustic levitation and streaming; Sound beams and parametric arrays; Statistical phenomena; Four-Wave mixing; Phase conjugation; Biomedical effects; and, Propagation in the atmosphere, ocean, waveguides, relaxing fluids, and bubbly liquids. Mark F. Hamilton and David T. Blackstock are Professors of Mechanical Engineering at The University of Texas at Austin. Active in the series of International Symposia on Nonlinear Acoustics (ISNA), they were co-chairs of the 12th ISNA, held in 1990, and editors of the proceedings Frontiers of Nonlinear Acoustics (Elsevier). They have received various awards from the Acoustical Society of America for their research in nonlinear acoustics.Hamilton's interest in nonlinear acoustics began with his doctoral work under F.H. Fenlon at Pennsylvania State University. As the Acoustical Society's F.V. Hunt Postdoctoral Fellow in 19831984, he spent the year at the Mathematics Institute of the University of Bergen in Norway. He followed this with a second year of postdoctoral study at Applied Research Laboratories of the University of Texas at Austin. He joined the Mechanical Engineering faculty of UT at Austin in 1985. He is well know in nonlinear acoustics for his research on sound beams, waveguides, computational methods, and waves in solids.Blackstock also began his research on nonlinear acoustics as a doctoral student, in F.V. Hunt's laboratory at Harvard University. He spent the decade of the 1960s in Rochester, New York: three years at General Dynamics/Electronics and seven years in theUniversity of Rochester's Electrical Engineering Department. Since 1970 he has been at the University of Texas at Austin. Currently he holds a joint appointment at Applied Research Laboratories and the Mechanical Engineering Department. His research in nonlinear acoustics has been on the Burgers equation, weak shock theory, and various applications such as sonic boom, finite-amplitude noise, and medical ultrasonics. Mark F. Hamilton and David T. Blackstock are Professors of Mechanical Engineering at The University of Texas at Austin. Active in the series of International Symposia on Nonlinear Acoustics (ISNA), they were co-chairs of the 12th ISNA, held in 1990, and editors of the proceedings Frontiers of Nonlinear Acoustics (Elsevier). They have receivedvarious awards from the Acoustical Society of America for their research in nonlinear acoustics.Hamilton's interest in nonlinear acoustics began with his doctoral work under F.H. Fenlon at Pennsylvania State University. As the Acoustical Society's F.V. Hunt Postdoctoral Fellow in 19831984, he spent the year at the Mathematics Institute of the University of Bergen in Norway. He followed this with a second year of postdoctoral study at Applied Research Laboratories of the University of Texas at Austin. He joined the Mechanical Engineering faculty of UT at Austin in 1985. He is well know in nonlinear acoustics for his research on sound beams, waveguides, computational methods, and waves in solids.Blackstock also began his research on nonlinear acoustics as a doctoral student, in F.V. Hunt's laboratory at Harvard University. He spent the decade of the 1960s in Rochester, New York: three years at General Dynamics/Electronics and seven years in theUniversity of Rochester's Electrical Engineering Department. Since 1970 he has been at the University of Texas at Austin. Currently he holds a joint appointment at Applied Research Laboratories and the Mechanical Engineering Department. His research in nonlinear acoustics has been on the Burgers equation, weak shock theory, and various applications such as sonic boom, finite-amplitude noise, and medical ultrasonics.